Located in the heart of West Texas, Lubbock is a thriving city of more than 200,000 people and serves as the center of the region’s economy, education, and health care. As the distribution and wholesale center of West Texas, it’s earned the nickname “Hub City”. The Lubbock area is also the largest cotton-growing region in the entire world and it hosts The National Cowboy Symposium and Celebration, an annual event celebrating the imagery and heritage of the Old West cowboy each September. Lubbock is also home of the historic Cactus Theater. Built in 1938 it was originally a “second run” picture theater but was eventually run out of business by the advent of home televisions sets and six new “drive-in” theaters in 1958. It was later revived and now is a central venue for Lubbock’s entertainment with acts such as the Cactus Cuties who have become YouTube sensations and appeared in a recent episode of Disney Channel’s “Cory in the House”. 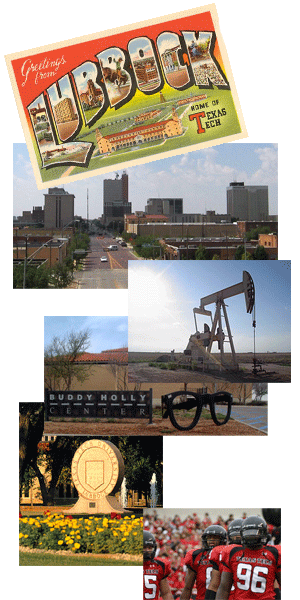 A few notable people who have called Lubbock home include Buddy Holly and several country musicians including Jimmie Dale Gilmore, Mac Davis, Terry Allen, The Maines Brothers, and Lloyd Maine’s daughter, Dixie Chicks singer, Natalie Maines. And a few athletes: Shanna Armstrong (Three-Time Ultraman World Champion) Marsha Sharp (Women’s Basketball Coach who won TTU eight conference championships and a national title.) and three track athletes from Texas Tech Mike Mathieu, Andrae Williams and Shereefa Lloyd earned medals for their respective countries in the Beijing Olympics in 2008. Also the home of developer Delbert McDougal (You can purchase his book, Failure is Not an Option here) who was behind what was described as “the largest privately-financed urban renewal project in America” for the transformation of the North Overton neighborhood in Lubbock. Lubbock is also the home of Texas Tech University, the largest comprehensive higher education institution in the western two-thirds of Texas. Some notable alumni of TTU include John Denver, Pat Green, Zack Thomas (seven-time NFL Pro Bowl selection), Wes Welker (New England Patriots), Mike Smith (former linebacker for the Baltimore Ravens), Byron Hanspard (former running back for the Atlanta Falcons), Sonny Cumbie (Quarterback for the LA Avengers), Sheryl Swoopes, Mark Lanier (nationally recognized trial attorney), Dr. O. Wayne Isom (performed David Letterman’s quintuple bypass heart surgery), late astronaut Rick Husband, George Eads of CSI, Colby Donaldson of Survivor, Bernard Harris (first African-American to walk in space), Scott Pelley (CBS news anchor and correspondent), and E. J. Holub (TTU’s first all-American football player and Super Bowl champion with the Kansas City Chiefs). Other nearby colleges include Lubbock Christian University in Lubbock and Wayland Baptist University in the town of Plainview and South Plains College in Levelland. 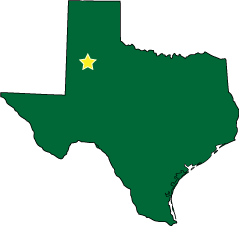 Action Printing is proud to serve our unique community and to bring the friendly spirit of Texas to our customers all across the nation.